What rules? The rules that the Church established. In this case, the rule about the Sabbath. Any self-respecting Jew would have known better than to “work” on the Sabbath. Jesus and his crew were working by taking grain from the field on the Sabbath. Jesus is scolded for working on the Sababth. In return, Jesus points out where the “rules” were also being broken by the priests who desecrated the Sabbath, and David (their national and religious hero) was also known to break the Sabbath. Jesus is starting to point out the fact that He is Lord of Sabbath. The concept of the Sabbath is to remind God’s people that rest is part of the equation for abundant life, not just a strict law of obedience. A (Application): Trust me when I say that rest is important. I need rest, so that God can speak to my mind, body, and soul. But even more important, Jesus is pointing out that their salvation is not to rest in laws of human origin, but to be in tune with God’s call for them that day. For whatever reason, Jesus said that he trumps the Sabbath, and not the other way around. The problem I see with a religion that allows borders to trump discerning God’s will is that we will forget God’s bending towards grace and mercy, God’s abundant and steadfast love. So, where do we draw the line? Perhaps the line is something we always discern? And if that is our way, then we need to train members of the body of Christ to discern God’s voice. 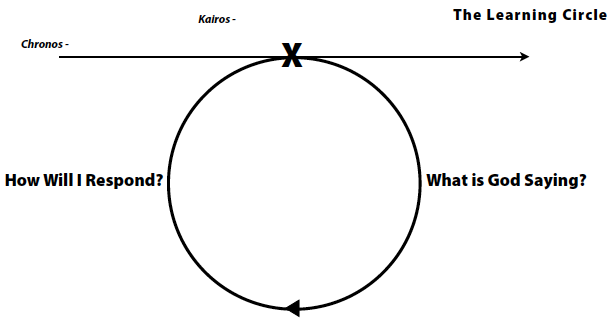 At our congregation we ask people to notice “kairos” moments (aka “God moments” or “Aha moments”). These can be positive or negative moments, which give us pause (like a Sabbath). At this point, we discern 2 questions: What is God’s word of grace for me this day? And What would God have me do? So, what borders have your religious inclinations mounted? Where have you seen folks cross borders to be the Gospel to others? What kairos moments have you had lately? What have you done in response to those moments? P (Prayer): Lord, help us to discern your will for us in this place and time. Amen. This entry was posted in Digging Daily and tagged discern, Jesus, kairos, Lord, Sabbath. Bookmark the permalink.